and never actually prayed for them? or you totally forgot about them by the time you got around to pray. pray for someone other than yourself? THIS IS WHY I CREATED THE PRAYER PROJECT. To help you experience firsthand the transforming, healing and unifying power of intercession. Intercession - The act of saying a prayer on behalf of another. 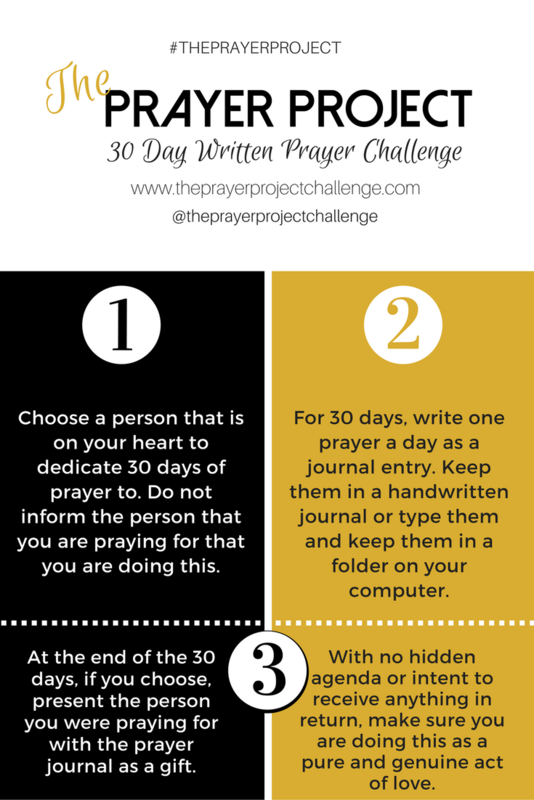 The Prayer Project™ is a 30-Day written prayer challenge that was created to challenge you to push past your normal everyday prayer routine and help you begin praying more focused and specific prayers for others just as you do for yourself. You may be wondering, "well, why would I want to do that?" Well... I'm glad you asked! Did you know that committing to pray for an individual is one of the most selfless acts anyone can perform. It says, “I choose to love you. I care for your soul and your well being." It takes any differences that you have with that individual, release any desired control and place it God’s hands. Not only does this selfless act of love benefit the individual that you're praying for, it greatly benefits you! It strengthens your personal prayer life and your relationship with the Lord. It softens your heart to anger and hurt by allowing you to release those burdens to God. Intercession helps you to develop a compassionate and unselfish heart. You become less likely to talk about people and their problems behind their backs and more likely to pray for them. And overall, it is exciting! It allows you to see lives change and God’s hands at work in the lives of others. Intercession helps you redirect your focus. Instead of immediate judgment of a person, you will be led to pray for them. And what better way to help someone you love than by taking your concerns for them to the One who created them. It’s an honorable act that is reverenced by God. Yes! I'm ready to join now! I'm challenging you to write a prayer everyday... for ONE person... for 30 days straight. I know, I know... It sounds a little intimidating but let me explain. All you need to do is follow these 3 steps. but no worries, I will guide you through! In these emails I will cover and discuss in depth the benefits as well as the challenges of praying for others. I will share some of my experiences and stories, and I will share what God says about prayer in His Word. The purpose of the weekly emails is to enlighten you, encourage you, give you a boost when you feel like giving up on the challenge, give you something to "chew on" for the week ahead and provide you with scripture and helpful tips to give you the push you may need during the challenge. A FREE "mini power prayer packet"
And guess what? I have created even MORE resources for you to help guide you through the challenge. Throughout previous challenges, I carefully listened to your concerns. One being "I don't know what to pray for!" another being, "I just lost steam, I fell off." So I've taken my time and worked very hard on creating a 30 DAY POWER PRAYER PACKET! I am so excited for you to use this! I made sure to fill this packet to the brim and pack it with everything you'll need to guide you through each and every day of the challenge. Below is a peek inside the 30 Day Power Prayer Packet. Want a copy of this mini version? Join the challenge to grab your copy! If you REALLY want to be prepared for the challenge, this is the best way to go. GET YOUR 30 Day Prayer Packet Now! Don't forget to sign up for the challenge! Click below to join.